The second re-design of the sega genesis. 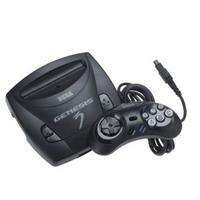 The last and rarest version of the genesis console released by Sega. Very collectible. The 3rd in the series, named the Genesis 3, was released by Majesco, not SEGA. Although it was under permission of SOA, that model is MK-1641, the MK 1601 is the original, and the MK 1631 is the second of the series. Announced in 1997 as a "budget" version, the Genesis 3 was manufactured by Majesco. In order to cut costs, the expansion port and circuitry were omitted, which made the Genesis 3 incompatible with the Sega CD, Sega 32X, Power Base Converter, and Virtua Racing. Also, due to a correction of a bug in the memory controller, some games which exploited this bug are also incompatible, namely Disney's Gargoyles. It was released in 1998 as the "Genesis 3" in North America only. It originally retailed for $50 and was later lowered as far down as $19.99. In addition, Japanese Megadrive cartridges (which do not contain an internal region lockout) can be played without a converter or modification, as the cartridge slot, which is the same shape as the original Japanese console, allows for these cartridges to be inserted freely.